Article abstract A nationwide survey and recent information documented 57 patients with Creutzfeldt–Jakob disease (CJD) who had received dura mater grafts during the period between January 1979 and September 1999. At least 54 of these 57 patients received the same brand of dura mater graft from the same processor. Mean age at disease onset in the 57 patients with dural grafts was younger (51.9 years) than that in patients with sporadic CJD (63 years) (p < 0.0001). Initial symptoms were cerebellar ataxia, disorientation, and visual or oculomotor disturbance. eric dural grafts during neurosurgical procedures or orthopedic procedures.2 Between May 1996 and September 1999, 14 more patients with dural grafts were found to have CJD. Although 27 patients with CJD associated with cadaveric dural grafts have been reported worldwide,3,4⇓ including 10 cases in Japan,5-7⇓⇓ no large-scale patient surveys concerning the frequency of various clinical features have been done since the first report from the United Sates in 1987. We report the details of a major outbreak of CJD transmitted through dural grafts in Japan. In 1996, a questionnaire was mailed nationwide by the Japan CJD Surveillance Group to 4017 neurologic, psychiatric, and neuropathologic departments in hospitals with 100 or more beds reporting a diagnosis of CJD in patients between January 1979 and May 1996. In most cases with dura mater implants, detailed information was obtained by a member of the surveillance group who visited the referral hospital or conducted a postmortem review of the case records. The diagnosis was considered to be definite, probable, or possible. The diagnosis of definite CJD required neuropathologic confirmation. Probable cases were histopathologically unconfirmed, but showed neurologic deterioration including dementia and at least three of the following: cerebellar, pyramidal, or extrapyramidal signs; myoclonus; ocular motor disorders; and periodic EEG patterns. Patients who presented with at least one of the “probable group” criteria were included in the “possible group,” including patients for whom CJD could not be ruled out. The differences between patients with dura mater graft and sporadic cases without graft were assessed by a two-way analysis of variance. Analyses were conducted using STATView version 4.58 for Windows (Cary, NC). The survey, conducted between January 1979 and May 1996 in Japan, identified 829 patients diagnosed with prion diseases, including 706 patients with sporadic CJD, 35 with Gerstmann–Sträussler–Scheinker syndrome, and 45 with familial CJD. Of these 829 patients, 43 had received cadaveric dural grafts during neurosurgical procedures, including 9 previously reported cases.5-7⇓⇓ Between May 1996 and September 1999, 14 additional patients had been identified as having had dural grafts. Of these 57 CJD patients with dura mater grafts, 12 fell into the “definite” category and 45 into the “probable.” These patients received cadaveric dura mater grafts during neurosurgical procedures (20 meningioma or other tumor, 15 aneurysm or intracerebral hematoma, 5 acoustic neurinoma, 13 decompression for facial nerve spasm or trigeminal neuralgia, 3 Arnord–Chiari malformation, and 1 ossification of the posterior longitudinal ligament). Most commercially available dura mater products at that time were fabricated by two German companies: Lyodura, manufactured by B. Braun (Melsungen, Germany); and Tutoplast, by Biodynamics (Erlangen, Germany). Since 1979, the number of patients receiving dura mater grafts of Lyodura was approximately 20,000/y. Beginning in October 1985, approximately two thirds of these patients received Lyodura and one third received Tutoplast. Of the 57 patients, 54 had all received the same type of lyophilized cadaveric dura graft, Lyodura, which was sterilized with gamma irradiation without 1 N NaOH treatment. Lot numbers were not identified for any of the grafts. Most (51/57) received grafts between July 1981 and November 1987 (figure 1). In three patients who underwent dura mater implantation (two in 1986 and one in 1991), the origin of the graft was unknown. Figure 1. Number of Creutzfeldt–Jakob disease patients with dura grafts and year of operation (Japan, 1979–1991). Male:female ratio was 1:1.5. The mean age at onset among the 57 patients with dural grafts was 51.9 years (SD ± 14.1 years), which was significantly younger than the age at onset for patients with sporadic CJD (63.0 ± 10.4 years) identified in the survey (p < 0.0001). In particular, the age at onset of 12 patients with grafts (21.1%) was less than 38 years (15 ∼ 38 years), as compared with 20 of 693 patients (2.9%) with sporadic CJD having an onset at age less than 40 years. Latency from graft implantation to the appearance of the first symptoms varied from 16 to 193 months (mean ± SD 98.9 ± 45.9 months) (figure 2). The duration from onset to death was 14.6 ± 13.4 months (range, 3 to 81 months). Figure 2. Number of Creutzfeldt–Jakob disease (CJD) patients with dura mater grafts by incubation period (from grafts to onset of symptoms of CJD). No patient had a family history of CJD but one had the Met232Arg mutation at the prion gene. The prion protein DNA genotype for polymorphism at codon 129 was present in 21 patients, 18 of whom exhibited methionine homozygosity, and 3 with methionine or valine heterozygosity. None had valine homozygosity. The codon 219 polymorphism was analyzed in six patients, five of whom exhibited glutamic acid homozygosity, and one with glutamic acid or lysine heterozygosity. The initial symptoms of patients with dura grafts were cerebellar ataxia (56.1%), memory disturbance (68.4%), disorientation (56.1%), abnormal behavior (28.1%), and visual disturbance or abnormal external ocular movement (50.9%) (table). Myoclonus developed in 66.0% of dura mater–associated CJD and akinetic mutism evolved in 56.0% of patients within 3 months of onset. Cerebral ataxia, disorientation, and disturbances of visual or external ocular movement were significantly more common in patients with dural grafts compared with those with sporadic CJD (p < 0.0001). No significant difference was observed between early symptoms of CJD and the site of the graft. Brain images (CT or MRI) in 54 of 57 patients showed brain atrophy. Images from three patients revealed no atrophy even 1 to 2 years after the onset. Periodic synchronized discharges in the EEG were present in 51 of 54 patients identified by the questionnaire. The survey revealed an unexpectedly large number of patients with CJD associated with cadaveric dural grafts. The results suggest that patients with dural grafts differ from cases of sporadic CJD in terms of clinical features with respect to a younger age at onset of the disease and more frequent cerebellar ataxia in the initial symptoms. Cerebellar ataxia, disorientation, and disturbances of visual or external ocular movement are more common initial symptoms in patients with dura-associated CJD than in those with sporadic CJD. Peripheral administration of the prion protein has caused diseases such as growth hormone–associated CJD and new variant CJD, and is associated with a primary cerebellar ataxia similar to that seen in kuru, whereas a primary inoculation in the form of dural grafts or deep electrodes in the cerebrum is thought to result in a primary demential clinical syndrome similar to that seen in most cases of sporadic CJD.3 In the current study, however, the initial symptoms of CJD in patients with dural grafts were predominantly in cerebellar ataxia, disorientation, and disturbances of visual or external ocular movement. The incubation period from the implantation of dura mater to the onset of symptoms averaged 98.9 months (16 to 193 months), similar to that reported in cases seen abroad with stereotaxic deep electrode exposure and dural grafts. Patients fell into two distinct groups with respect to incubation period. One group of 17 patients averaged a shorter period (≤6 years) and 40 patients had a longer period (>6 years). That some patients had a long incubation period suggests that the incidence of CJD associated with dural grafts can be expected to increase in the future. 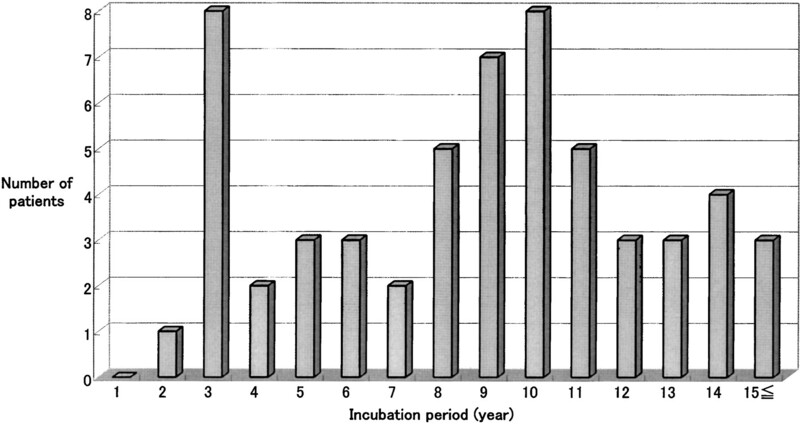 No correlation was observed between age at onset and incubation period. Molecular–genetic analysis was performed in 21 of 57 patients with dura-associated CJD. As in sporadic CJD or other iatrogenic cases of CJD, none of the known disease-specific prion gene mutations was found in these 21 patients, except for one who had the Met232Arg mutation. The Met232Arg mutation is well known in familial CJD. Homozygosity, Met/Met, at codon 129 of the prion protein was present in 18 of 21 cases. Homozygosity in the normally polymorphic valine–methionine codon 129 is much more common in sporadic or iatrogenic CJD than in the normal population of North America or the United Kingdom, suggesting a genotypic predisposition to CJD in sporadically or iatrogenically infected individuals. However, the polymorphic ratio of codon 129 is different in Japan. The normal population in Japan has a polymorphic ratio of 91.6% methionine–methionine, 8.4% methionine–valine, and no valine–valine. It remains possible that such common methionine homozygosity predisposes for a high incidence of CJD associated with dura implantation in Japan. One of six patients exhibited glutamic acid/lysine heterozygosity at the codon 219. The codon 219 heterozygous polymorphism reportedly was not found in 85 cases of sporadic CJD in Japan.8 Further studies are needed to clarify the frequency of the codon 219 polymorphism in patients with CJD. The number of patients who received cadaveric dura mater grafts in Japan during the period between 1979 and 1991 is estimated to be approximately 20,000 per year. When compared with the annual nationwide incidence rate of sporadic CJD (0.5868/y/1 million population), the relative risk to patients receiving dura mater grafts is estimated to be extremely high (maximum 104.9; minimum 29.2).9 No doubt cadaveric dura mater transplantation, particularly in the mid-1980s, was responsible for the development of the disease. The source of the allogenic dura mater in these patients was not a registered tissue bank but instead was a commercial company (B. Braun). The actual specimens imported from this company were processed in 1973. No details concerning the donor selection criteria nor the actual donor records were released by the company, and several specimens were pooled together in the same container during the manufacturing process. Since its introduction in 1972, more than 1 million packages of Lyodura have been used in Japan. Until the end of 1987, Lyodura was sterilized by gamma irradiation without NaOH treatment, which does not inactivate infectious prion proteins. In 1986, the American Neurologic Association’s Committee on Health Care Issues recommended immersion in 1 N NaOH for 1 hour at room temperature as a practical condition for inactivation of the CJD agent. The supplier began supplementing the standard sterilization procedure with 1 N NaOH immersion for 1 hour beginning in May 1997. However, Lyodura without 1 N NaOH treatment was not recalled from hospitals and continued to be used in Japan until 1991. The risk of transmission is thought to have been reduced by strict donor selection and by 1 N NaOH treatment aimed at inactivating the CJD agent. However, a high concentration of NaOH (between 0.25 and 2 N) lengthened the incubation period in mice infected with the CJD strain, but did not completely block the transmission.10 The recommendation that all existing cadaveric dura mater products be banned was finally endorsed in 1997 by both the World Health Organization and the Japanese Ministry of Health and Welfare. Supported by Grants-in-Aid from the Ministry of Health and Welfare of Japan. The authors thank the neurologists, psychiatrists, and neuropathologists throughout Japan, whose professional standards and cooperation made this study possible. They also thank Dr. Tetsuyuki Kitamoto, Department of Neurologic Science, Tohoku University School of Medicine, Sendai, for carrying out the prion protein DNA genomic analysis. The Japan CJD Surveillance Group is founded by the Ministry of Health and Welfare of Japan. Will RG, Ironside JW, Zeidler M, et al. A new variant of Creutzfeldt–Jakob disease in the UK. Lancet . 1996; 347: 921–925. Sato T, Hoshi K, Yoshino H, et al. Creutzfeldt–Jakob disease associated with cadaveric dura mater grafts: Japan, January 1979–May 1996. MMWR . 1997; 46: 1066–1069. Prichard J, Thadani V, Kalb R, et al. Rapidly progressive dementia in a patient who received a cadaveric dura mater graft. MMWR . 1987; 36: 49–55. Brown P, Preece MA, Will RG. Friendly fire 148 in medicine: hormones, homografts, and Creutzfeldt–Jakob disease. Lancet . 1992; 340: 24–27. Miyashita K, Inuzuka T, Kondo H, et al. Creutzfeldt–Jakob disease in a patient with a cadaveric dural graft. Neurology . 1991; 41: 940–941. Shimizu S, Hoshi K, Muramoto T, et al. Creutzfeldt–Jakob disease with florid-type plaques after cadaveric dura mater grafting. Arch Neurol . 1999; 56: 357–362. Sato T, Hoshi K, Masuda S, et al. Iatrogenic Creutzfeldt–Jakob disease: associated with cadaveric dura mater grafts in Japan [in Japanese]. Shinkei Shinpo (Prog Neuroscience) . 1999; 43: 145–154. Shibuya S, Higuchi J, Shin R-W, et al. Codon 219 Lys allele of PRNP is not found in sporadic Creutzfeldt–Jakob disease. Ann Neurol . 1998; 43: 826–828. Nakamura Y, Aso E, Yanagawa H. Relative risk of Creutzfeldt–Jakob disease with cadaveric dura transplantation in Japan. Neurology . 1999; 53: 218–220. Tateishi J, Tashima T, Kitamoto T. Inactivation of the Creutzfeldt–Jakob disease agent. Ann Neurol . 1988; 24: 466.